Wouldn't it Be Good to See a Tweet's Ripples? 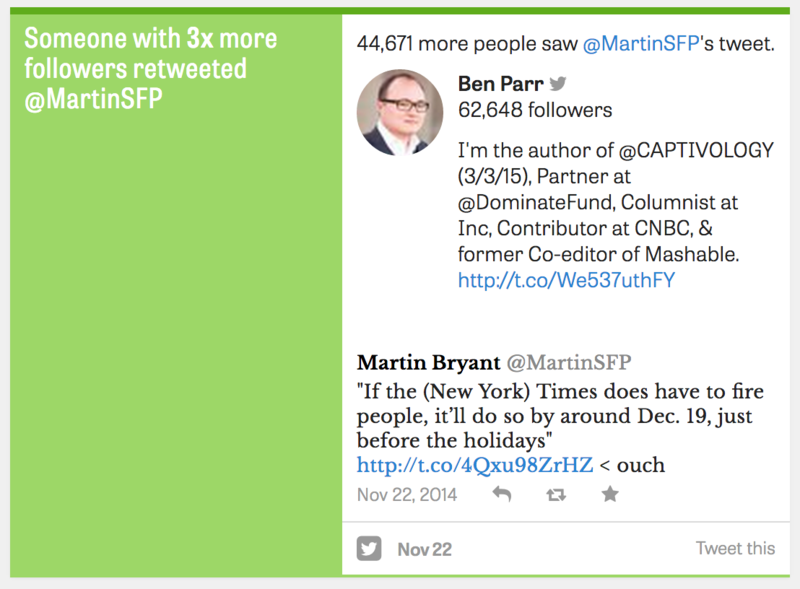 If you help someone’s tweet make a splash, wouldn’t you like to see the ripples? At some point in the past couple of weeks, Twitter switched off the notifications that let me know someone retweeted or favorited a tweet that I retweeted. I’m not sure exactly when, but they’ve definitely gone. It sounds like a small thing to cut, but I really miss it. It’s not like the feature is gone for everyone; a quick search for “retweeted your retweet” shows that it’s something a lot of people talk about. All I can assume is that I’m part of some A/B test to see how removing the feature impacts user behavior. Seeing that retweeting someone else amplified their audience and led to other people sharing that tweet even further was a good feeling for me. Sure, maybe some people felt that it made their Notifications stream a little too crowded at times (especially if they retweeted something that went viral) but it would be nice to at least have the option of seeing these notifications. How do I turn off faves or retweeted your retweet in my notifications? I can see why Twitter may be tempted to get rid of them, but maybe it’s all down to presentation? Presented in the right way, they could be a positive step in boosting user engagement. ThinkUp, the startup founded by Anil Dash and Gina Trapani that provides plain-English insights into your social media activity, gives you a bit of that ‘I did a good thing’ feeling (see the screenshot below). What I like about this is that it emphasizes the result of the action, not the action itself. Still, it’s not quite the same as seeing granular information about how a tweet was shared onwards after you shared it. It’s not that accurate, either. There’s no way that all of Ben’s followers saw that retweet. Some of them will be inactive accounts, or asleep, or on a break from Twitter. As we know from Twitter’s detailed Analytics offering, it has the data about precise tweet impressions to make this all a lot more accurate. 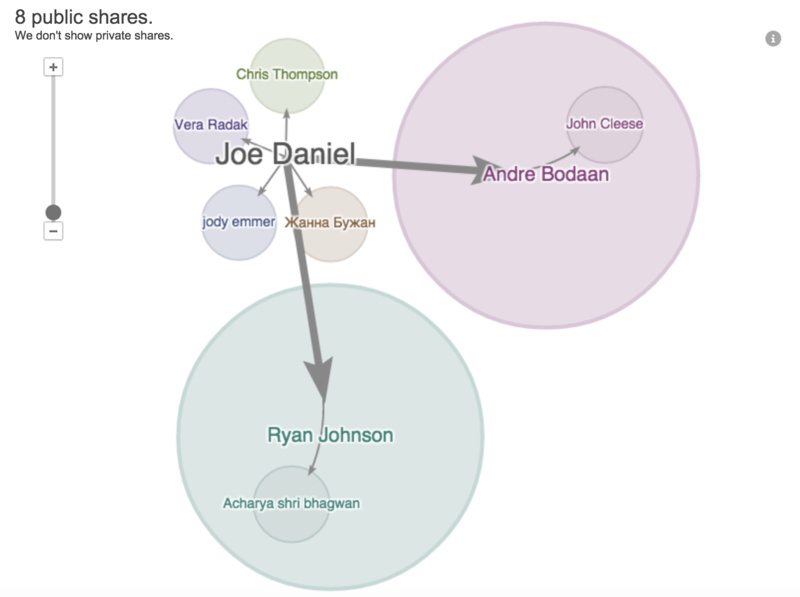 One of my favorite features in Google+ is Ripples, which maps out how a post has been shared, and who had the most influence over a piece of content’s dissemination. I’d love to see a feature like this in Twitter. The company didn’t respond to a request for comment towards this article, but given that it’s been gradually opening up its data with Analytics and full-history search now available to all, maybe that’s something it’s working on. After all, if you help a tweet make a splash, wouldn’t it be a good feeling to see the ripples?